Here is an example of a Brands beating all the competition and getting the best positioning to increase their brand visibility. 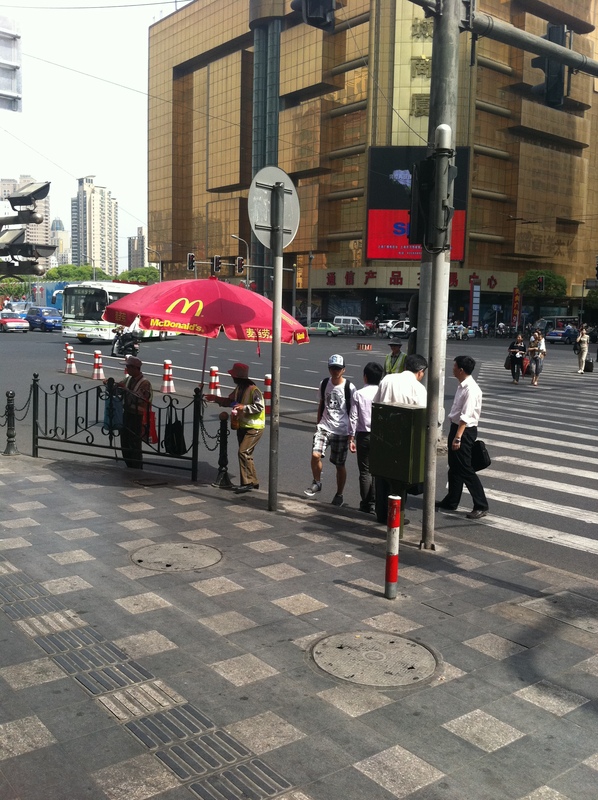 Near our Shanghai office there is a major intersection with McDonalds, Starbucks and multiple other fast food restaurants. We couldn’t help but notice that at corner restaurant the traffic officers were taking shade from the strong sun under McDonald’s branded umbrellas. As you can see in the picture the traffic officer benefits tremendously from having this umbrella. Whether it be on a rainy or sunny day the officer will be thankful for the gift from McDonald’s. This is truly a win win situation for the officer and the fast food restaurant. The traffic officer receives a free umbrella that protects him from the blazing sun & it keeps him dry from the downpour. On the other hand McDonald’s restaurants receive massive brand exposure at large street intersections like the one pictured above. Both pedestrians and cars can easily notice the colors of the umbrella with the yellow arc on the red background which are famously known and associated to McDonalds. With so many workers in China standing around, watching and waiting, this is an excellent and low cost way to increase brand visibility. This type of promo could work for other brands around the world just in the same way. Contact ODMasia for manufacturing customized promotional products. You can also visit our blog for more ideas of promotional products that your company can use for your next promotional campaign. Promotional Figurines – Pokémon by McDonalds China. McDonalds HK – Fifa World Cup Promotions. Traffic road cones as promotional displays.